Moxifur-DM Eye Drops is a combination of Moxifloxacin 0.5% and Dexmethasone 0.1% . Moxifloxacin is a fourth generation fluoroquinolone controls infection by inhibitting the dna gyrase & topoisomerase iv.Dexamethasone a potent corticosteroid effectively controls the inflammation by inhibiting the release inflammatory mediators. Keep in a cool & dark place. Below 25ºC. Do not allow to Freeze. Moxifur-DM Eye Drops combines moxifloxacin, an 8-methoxy fluroquinolone antibiotic and ketorolac tromethamine, a non-steroidal anti-inflammatory drug, intended for topical ophthalmic use. Moxifur-DM Eye Drops is indicated for steroid-responsive inflammatory ocular conditions for which a corticosteroid is indicated and where bacterial infection or a risk of bacterial ocular infection exists.The combination can also be used for post-operative inflammation and any other ocular inflammation associated with infection. 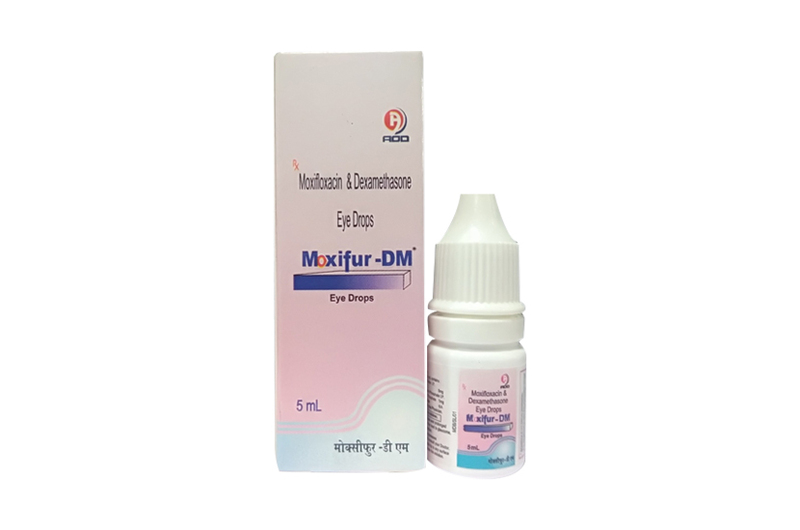 Moxifur-DM Eye Drops is contraindicated in epithelial herpes simplex keratitis (Dendritic keratitis), vaccinia, varicella, and in many other viral diseases of the conjunctiva and cornea, Mycobacterial infection of the eye and fungal diseases of ocular structures and in individuals hypersensitive to any of the components of the medication.. Prolonged use of steroids may result in glaucoma with damage to the optic nerve, defects in visual acuity and fields of vision, and posterior subcapsular cataract formation. One or two drops instilled into the conjunctival sac(s), every 4 to 6 hours. During the initial 24 to 48 hours, the dosage may be increased to 1 or 2 drops every two hours.Frequency must be decreased gradually or warranted by improvement in clinical signs. Care should be taken not to discontinue the therapy prematurely. Moxifur-DM Eye Drops is supplied in one Opeque Polethylene Bottle packed with printed labelled & cartons And Such 25 Carton Packed in a Shrink Sleeves & corrugated box.